Lars Lewandowski belongs to a very particular generation of 90s Berlin techno heads that seem to have remained stuck in time. We absolutely don't mean that in a negative sense. Far from it. 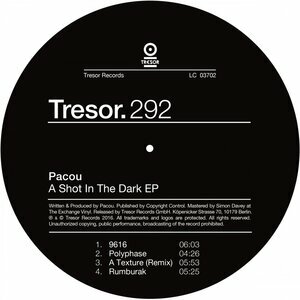 His productions under the name Pacou are as mesmerising and fresh as they were back then, and the artist has stuck to doing what he does best. No gimmicks, no passing trends, just single-minded techno experiments for dancefloor. Aside from his long-lasting relationship with Berlin's mighty Tresor label (and club! ), Pacou has released plenty of rocks on imprints like DJax, Music Man, and his own excellent Cache Records. He's back on the former this time, accompanied by a new and uncompromising four-tracker that packs a mean punch. "9616" sets the scene with an heavy techno swing that's simply impossible to ignore, not least because of its hypnotic tendencies, and the same goes for the subsequent acid bullets that drop out of the violent rhythm that is "Polyphase". "A Texture (remix)" unleashs an apocalyptic frenzy of dub sonics over heavy drums, and "Rumburak" finishes the killings off with a bouncy, off-kilter beat and one mother of a bassline. This is warmly recommended.